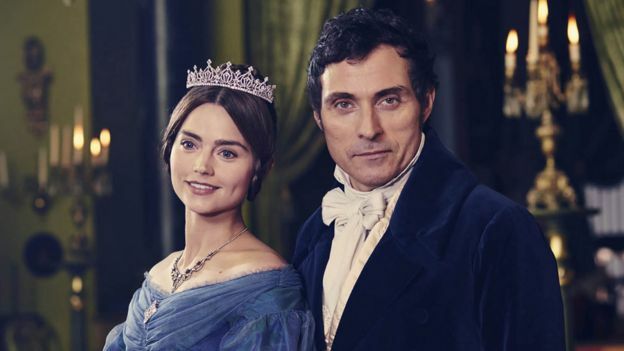 Playing Queen Victoria in a new eight-part ITV drama has been “such a gift”, actress Jenna Coleman has revealed. The first series of Victoria charts the early years of the queen’s reign and her courtship with Prince Albert, played by Tom Hughes. I’ve added episode stills from the first episode of Victoria to our gallery the episode is called “1×01-Doll 123” which airs Sunday 28th August at 9pm on ITV! I’ve added candids of Jenna Leaving Good Morning Britain studios this morning in London,enjoy! I’ve added a new portraits of Jenna for The Telegraph during the Victoria Press Day which was August 11. I’ve added a photoshoot of Jenna for the Guardian,you can also read her interview below,enjoy! She’s about to return in a leading role, playing Queen Victoria in ITV’s high-budget chronicle of the formidable monarch. It’s rare for British actors to hold the public’s attention, or enjoy quality parts, after abandoning an established soap character. Sarah Lancashire did it; arguably Martine McCutcheon did it, for a while. But on the whole, the less familiar you are the better. Jude Law’s start on daytime soap Families is now forgotten, likewise Ioan Gruffudd’s five years on Welsh-language Pobol y Cwm. (Most implausibly, Sir Ben Kingsley spent two years on Coronation Street in the 1960s, having an affair with Ken Barlow’s wife Val.) So how did Coleman travel from farm to castle in such a short time? Presumably having a Tardis helps. It paid off. The Beeb started taking note, and Coleman has since impressed in all her high-profile roles. She was wounded and aggressive as hard girl Lindsay James in Waterloo Road, impertinent as Oswald (she won the role because she could talk faster than Matt Smith). As Victoria, she is at her most vulnerable playing the young Queen; the arc toward the obstinate and grand presence Victoria eventually becomes is one Coleman is relishing. Her affection for her former Time Lord is clear. She originally joined the BBC’s flagship show as a viable love interest for Matt Smith, the pair flirting like colts and even kissing. However it was when the Doctor regenerated into Capaldi’s grouchy, blepharitic form that things got really interesting. Negotiating Clara’s love-anger at the disappearance of her handsome suitor and guilt towards the older man who needs her, was a skilful balancing act, resolving itself in a deeply touching relationship. Victoria is about other unusual relationships: that of the young queen and her manipulative German mother, who devised a system of rules to keep Victoria isolated and dependent; and the first cousin to whom she proposed. “On one level they’re Vic and Albert, teenage lovers getting to know each other. But they’re also playing roles, because it’s a unique business transaction.” Negotiating these contradictions, and avoiding the lavish blandness typical of many period dramas, is what concerns Coleman most. Top and trousers both motherofpearl.co.uk. Makeup: Valeria Ferreira at Caren using Dior Fall Look and Capture Totale Dreamskin Cushion. Photographer’s assistant: Nick Martin. Photograph: Jon Gorrigan for the Guardian. Despite her early success, she is keen to keep learning. She lists her favourite actors, all strong women with impeccable CVs, particularly on stage. “Helen McCrory, Ruth Wilson, Denise Gough – actors whose whole bodies are alive, you can’t take your eyes off them.” She talks with approval about the creative risk of Matt Smith’s current job, an improvised and ever-changing Anthony Neilson play at the Royal Court in London. Coleman has recently made the foray into big films, playing opposite Emilia Clarke in Me Before You. Do her ambitions lie in Hollywood? There has been a new Victoria clip released online,you can view it below. In this clip Victoria learns that she is going to become Queen of England.